I'm saying read, re-read would be more accurate. I first read this book a few years back. 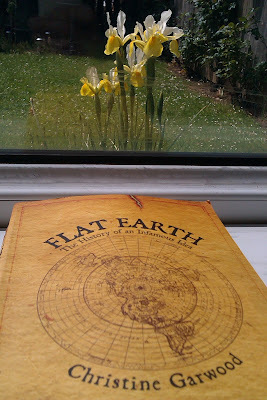 It's one of my all time favourites and what inspired me to read it again was the fact that Flat Earth Theory seems to be having a bit of a revival on-line at the moment. In a way it was always going to happen. Our collective thirst for conspiracy theories was sooner or later going to take us to the big one; the earth is flat. There is none bigger, and maybe none older. Firstly the book. The book details the history of the flat earth movement over the last few centuries. Introducing us to the various mavericks that have dared to believe in a flat earth in the face of modern science. The most notable being the 19th century zetetic philosopher Samuel Birley Rowbotham, aka Parallax. A larger than life character that literally springs from the pages. A veritable anti-hero that it's hard not to have a genuine admiration for. In fact, most of the flat-earth believers presented in the book have a certain amount of charm. All characters in the truest sense. I really urge you to read it. Now to the modern revival. I accidentally came across a few videos stating the earth was flat on YouTube. I must admit I'm a bit of a conspiracy buff, so I do watch my fair share of conspiracy vids, but even so I was surprised to see the flat earth pop up. Anyway, it turns out that there's a whole flat-earth community on there, many seemingly genuine believers. Some of the videos having thousands and thousands of views. I was actually really pleased to discover this. Ever since reading the book I've been fascinated by the idea of a flat earth and I'm glad to see it's still living and breathing out there. Although I'm not a flat-earther myself I am open minded enough to consider the idea. In fact, I think it's essential that we question our assumptions, and that we look for proofs ourselves instead of just accepting the word of other people. The flat earth idea is a great tool for doing that. We all know the earth is a ball, but how many of us can actually prove this for ourselves. After all, it does seem flat. At some point in childhood most of us ditched the evidence of our senses and accepted that we're walking around on a giant spinning ball. How many of us asked for scientific proof of this? xD I guess, in essence we just took someones word for it. My highlight in all this Flat Earth business was discovering Math Boylan's YouTube channel. Math is a comedian, artist and general polymath it would seem. He's the clown-prince of the YouTube Flat Earth Kingdom. He blurs the line between the real and the unreal. One of those rare people where it's difficult to tell at first if he's being serious or if he isn't. His YouTube channel - The NASA Channel - is a work of genius. Funny, thought-provoking, blurring all sorts of lines. The modern Parallax.